The Green Girl is going to continue her Traveling Green Girl Series with Electronic Devices. As I mentioned in The Traveling Green Girl: Carry Ons, I recommend including chargers for all your electronics in your carry on. I store all of my chargers in an Eagle Creek padded cube. I always leave my Eagle Creek padded cube on top of my backpack the night before my trip as a visual reminder to include my phone charger before I leave my house. When traveling internationally, you will need to make sure your electronics will be compatible with the electrical current in the destination country. Alternating current (AC) electricity is the most common type of electricity. Direct current (DC) electricity flows in one direction through a wire while AC electricity alternates direction in a back-and-forth motion. The advantage of AC over DC is that AC voltages can be easily transformed to higher or lower voltage levels. Voltage measures the electrical force. Hertz is the frequency of the AC signal. In the US, we run on 60 hertz so an American might notice that the flicker rate of a light bulb on Europe's 50 hertz power is different from back home. Most countries use electricity at approximately 220 volts/50hz, while North America uses 110-120 volts/60hz. The electrical socket configurations also vary from country to country. An adapter is simply a connector that changes the plug shape to match the outlet. It does not change the voltage or electrical output in any way. If you know that the plug shape is the only difference between your equipment and the electrical system you are planning to use, an adapter is all you need. Many devices and chargers have the ability to use either 110v or 220v built right in. You can determine a device's voltage rating by by looking at the label on the power supply. 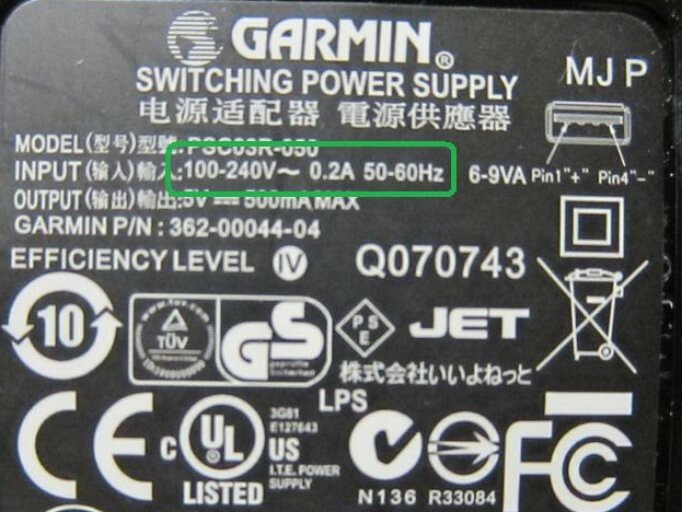 For example, Mr. Green Garmin's charger is rated for 100-240 volts and 50-60 hertz. Mr. Green Garmin does not require a converter or a transformer and only needs an adapter. Converters and transformers change the voltage but they do not alter the cycles. Converters are designed to operate for short periods of time. If you are using an electric appliance with a heating element or mechanical motor such as a hair dryer or iron, you will need a converter. Transformers, on the other hand, can be used for long term, continuous use. If you are using an electronic device such as a computer or television, you need a transformer. Keep in mind small appliances that are only rated for 100 volts like curling irons and blow dryers don't work well in 220 volt countries, even with a converter so if you are taking these items, make sure they are rated for 220 volts. When traveling to countries with direct current (DC), you must use an AC to DC converter or transformer. Thanks for providing such a good information about the electronics devices which is regularly used in the trip.